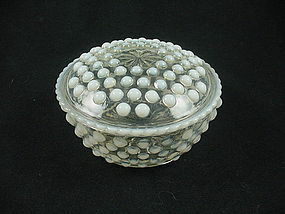 Moonstone is the name of this opalescent hobnail pattern that was produced by Hocking Glass Company from 1941 to 1946. 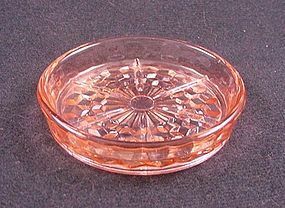 Offered here is the 4 3/4 inch round puff(or powder) box in excellent condition. See my other listings for more in this pattern. 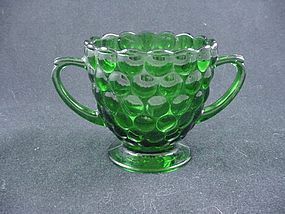 Moonstone is the name of this opalescent hobnail pattern that was produced by Hocking Glass Company from 1941 to 1946. Offered here is the rectangular cigarette box & cover in excellent condition. (I keep candy in mine...chocolate goes perfectly in everything.) See my other listings for more in this pattern. The Cube, or Cubist, pattern was made by Jeannette Glass Company from 1929 to 1933. It's often confused with Fostoria's American pattern and for good reason: both were designed by the same man. 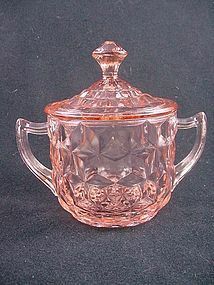 Offered here is the sugar bowl & lid in pink in excellent condition. 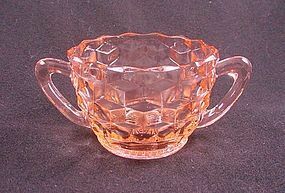 This is the large size sugar bowl - the smaller one doesn't have a lid. See my other listings for more in this pattern. 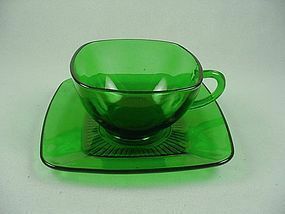 The Cube, or Cubist, pattern was made by Jeannette Glass Company from 1929 to 1933. 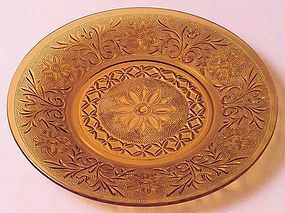 It's often confused with Fostoria's American pattern and for good reason: both were designed by the same man. 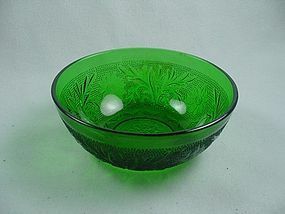 Offered here is the sugar bowl in excellent condition. This is the smaller size sugar that doesn't have a lid. See my other listings for more in this pattern. The Cube, or Cubist, pattern was made by Jeannette Glass Company from 1929 to 1933. It's often confused with Fostoria's American pattern and for good reason: both were designed by the same man. 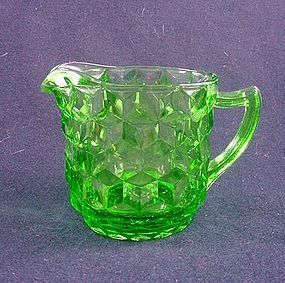 Offered here is the creamer in excellent condition. This is the smaller size creamer that goes with the sugar that doesn't have a lid. See my other listings for more in this pattern. The Cube, or Cubist, pattern was made by Jeannette Glass Company from 1929 to 1933. It's often confused with Fostoria's American pattern and for good reason: both were designed by the same man. 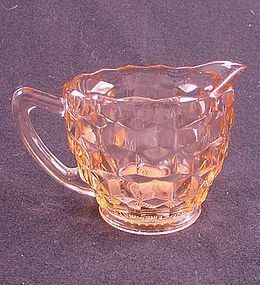 Offered here is the creamer in excellent condition. This is the larger size creamer that goes with the sugar that has a lid. See my other listings for more in this pattern. 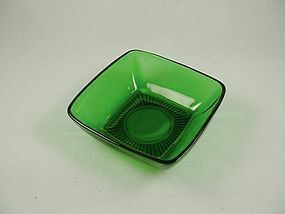 The Cube, or Cubist, pattern was made by Jeannette Glass Company from 1929 to 1933. It's often confused with Fostoria's American pattern and for good reason: both were designed by the same man. 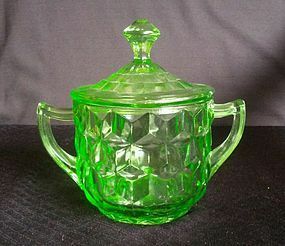 Offered here is the sugar & lid in green excellent condition. 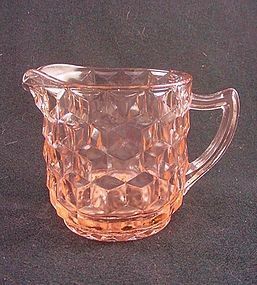 This is the larger size sugar bowl - the smaller size doesn't have a lid. See my other listings for more in this pattern. The Cube, or Cubist, pattern was made by Jeannette Glass Company from 1929 to 1933. It's often confused with Fostoria's American pattern and for good reason: both were designed by the same man. 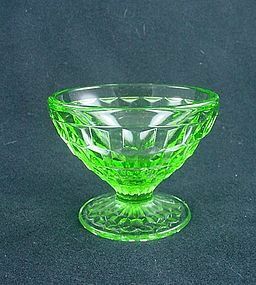 Offered here is the footed sherbet dish in green excellent condition. See my other listings for more in this pattern. The Cube, or Cubist, pattern was made by Jeannette Glass Company from 1929 to 1933. It's often confused with Fostoria's American pattern and for good reason: both were designed by the same man. 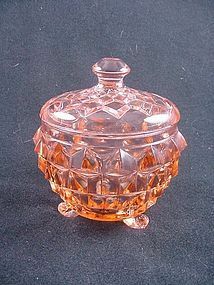 Offered here is the powder jar & cover in pink in excellent condition. See my other listings for more in this pattern. 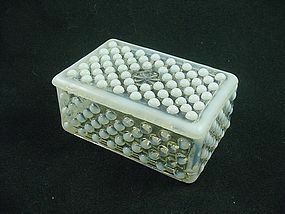 The Cube, or Cubist, pattern was made by Jeannette Glass Company from 1929 to 1933. 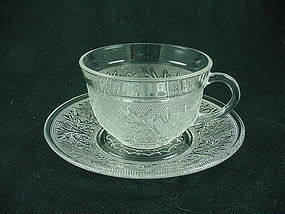 It's often confused with Fostoria's American pattern and for good reason: both were designed by the same man. 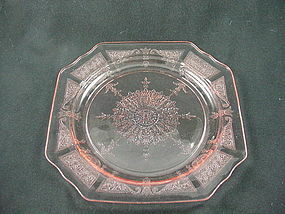 Offered here is the coaster in pink in excellent condition. See my other listings for more in this pattern.